Quoting from the research article’s plain language summary: ‘We find that some aspects of the space weather climate are in fact reproducible, they can be inferred from that of previous solar maxima. This may help understand the behaviour of future solar maxima.’ Solar wind variation is highlighted. Historic space weather may help us understand what’s coming next, according to new research by the University of Warwick, says Phys.org. 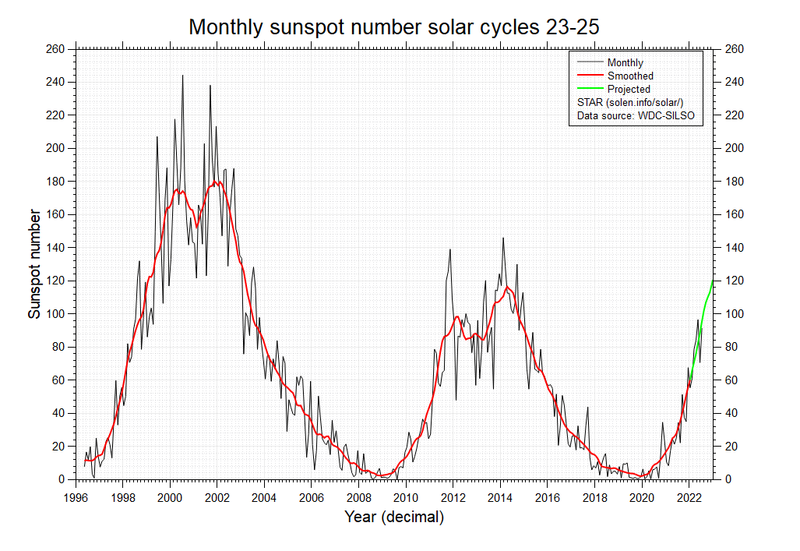 The sun goes through solar cycles around every eleven years, during which time the number of sunspots increases to the maximum point (the ‘solar maximum’). 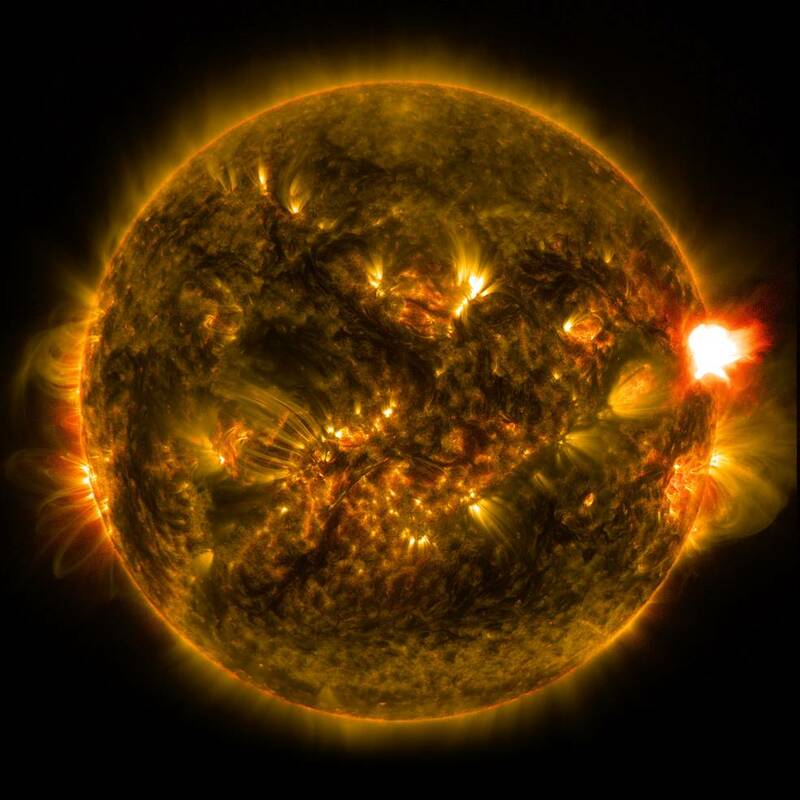 More solar activity means more solar flares, which in turn can mean more extreme space weather at earth. “We analysed the last five solar maxima and found that although the overall likelihood of more extreme events varied from one solar maximum to another, there is an underlying pattern to their likelihood, which does not change. Research article: S. C. Chapman et al. Reproducible aspects of the climate of space weather over the last five solar cycles, Space Weather (2018). How is this new – even a “breakthrough”?? We don’t know from the abstract the exact details of the ‘underlying repeatable pattern’ they refer to. But any repeatable pattern must say something about the Sun itself i.e. not totally random. you mean that bright shiny thing in the daytime sky affects Earth? who knew? 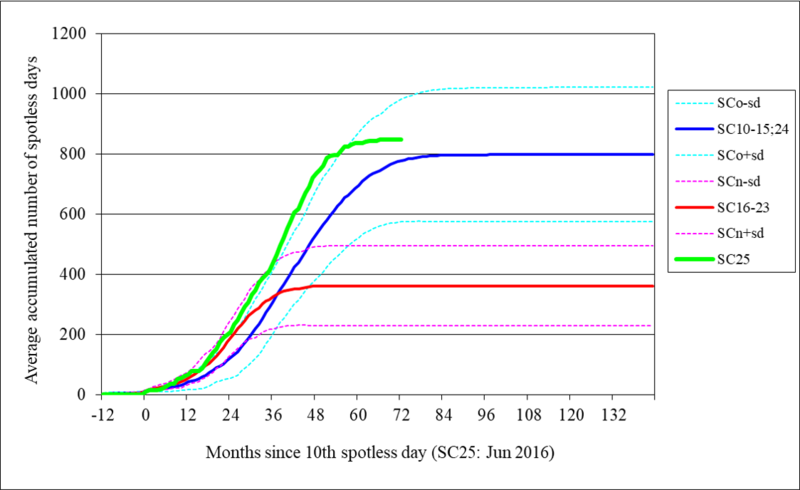 Currently (June 2018), the spotless days evolution seems to track the bold red line (SCn) better than the bold blue line (SCo), suggesting an early cycle minimum around mid-2018 +/- 3 months. 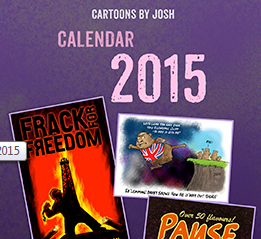 In that case, SC24 would have lasted less than 10 years and thus be relatively short. However, it is still too early to exclude a late minimum (mid-2020, +/- 1 year) with many spotless days, because the upper dashed blue line almost coincides with the bold red line at this stage of the solar cycle. More certainty is expected within the next 12 months as more data become available. This may be a break thru for them but is well known and common knowledge for others. If they have studied the effects of solar minimums in the past then they will know what to expect in the present. We are in a Grand Solar Minimum right now and far from Global warming we are about to experience a mini ice age that will bring freezing conditions and starvation to countless millions for many years to come, as it has in the past, but they dare not mention that. It would upset Malthus. Look him up.